Welcome to Scranton… – nomnom…Cupcake! 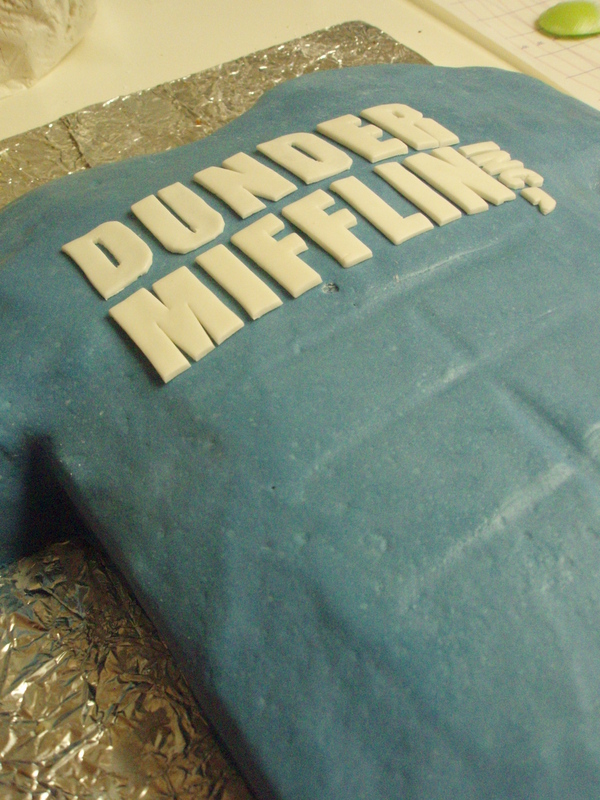 The latest creation is a surprise birthday cake for a huge Office fan. He got me sort of hooked on watching it, so I thought it pretty appropriate. 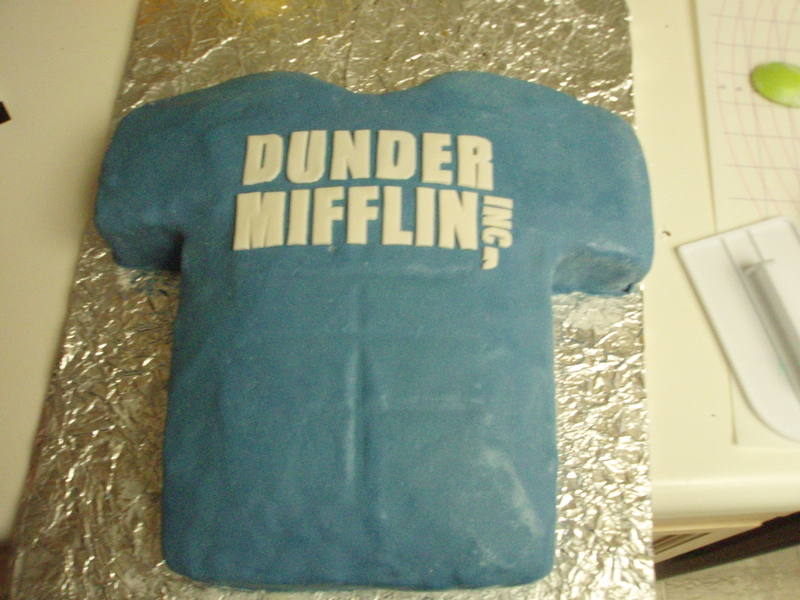 He’s even got paraphernalia, and is known for wearing this blue Dunder Mifflin t-shirt… which he even donned under a sport coat for a FORMAL Christmas party. That shows some dedication. So? Combine two favorite things- his favorite shirt, and my favorite hobby. 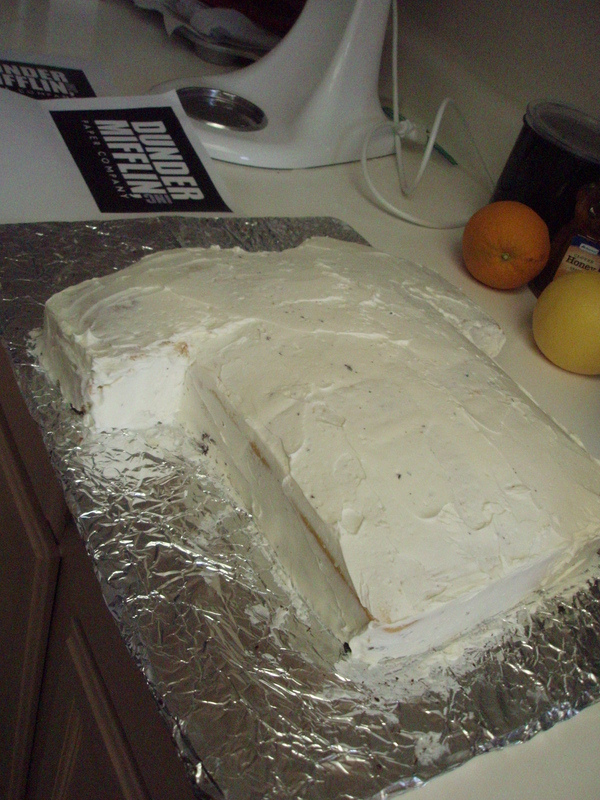 Step 1: The bare t-shirt cake, made of a 9×13″ (2 layers) and the sleeves were cut from the corners of a (9×9 square). 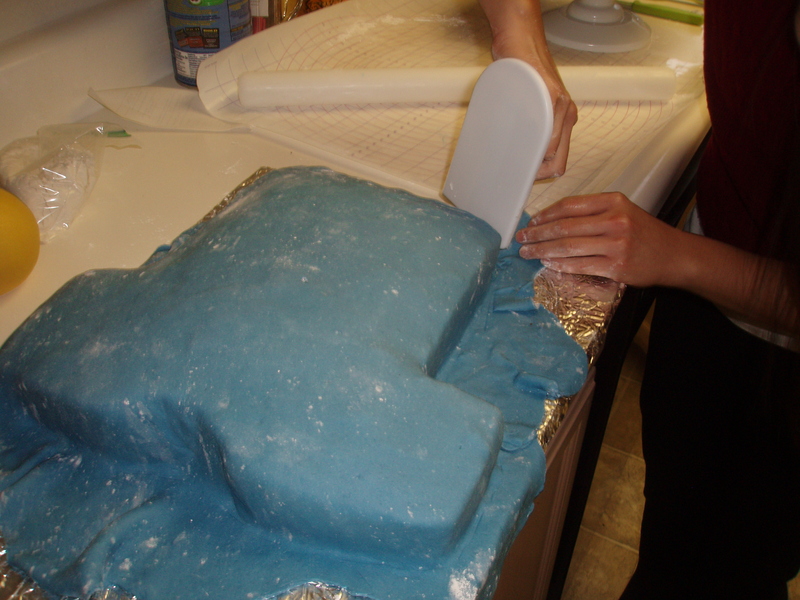 Step 3: Covering the t-shirt with blue fondant. 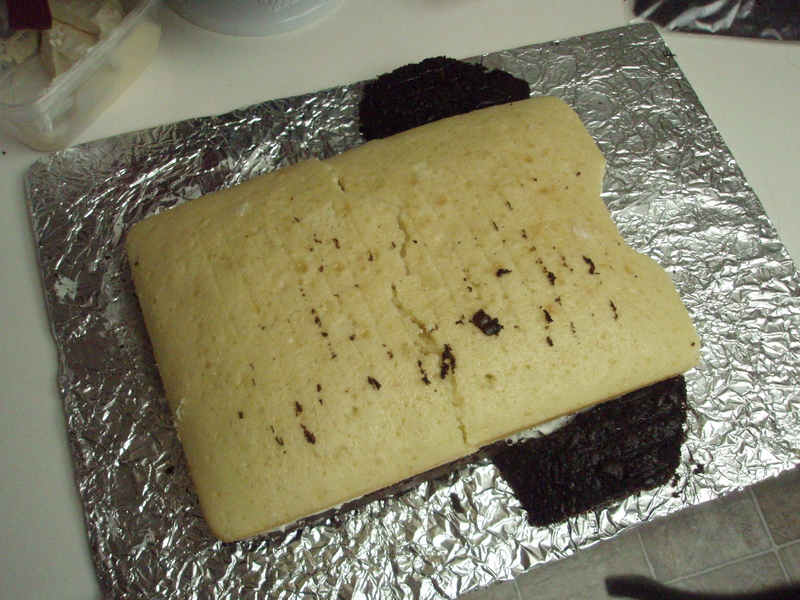 I tried a different coloring method this time- instead of making white fondant from the marshmallows and sugar and THEN dying it, I added the dye while the marshmallows were still in melted form. This was a lot easier as far as achieving uniform color. Just a tip! Then add powdered sugar, just be sure to overcompensate for the white of the powdered sugar, or else you’ll end up with a pastel. Step 4: The block letters- made of white gum paste. I printed out the logo at work (what are the odds, one of my co-workers was standing in the copy room when I sprinted to grab them off the copier before anyone saw, so awkward. Luckily it prints face down… I love the guy who programmed privacy into corporate copiers. Needless to say I was flustered and awkward as I snatched the sheets off the printer.) So just cut out the letters and traced them with a knife on the gum paste. Step 5: You can see this in the photo above, but took a close up just to be sure… check out those sculpted abs 🙂 So running joke is Griffin has amazing abs and on a group trip there were certain people always trying to de-shirt him. So thought I’d pop that little inside joke in. Why not? 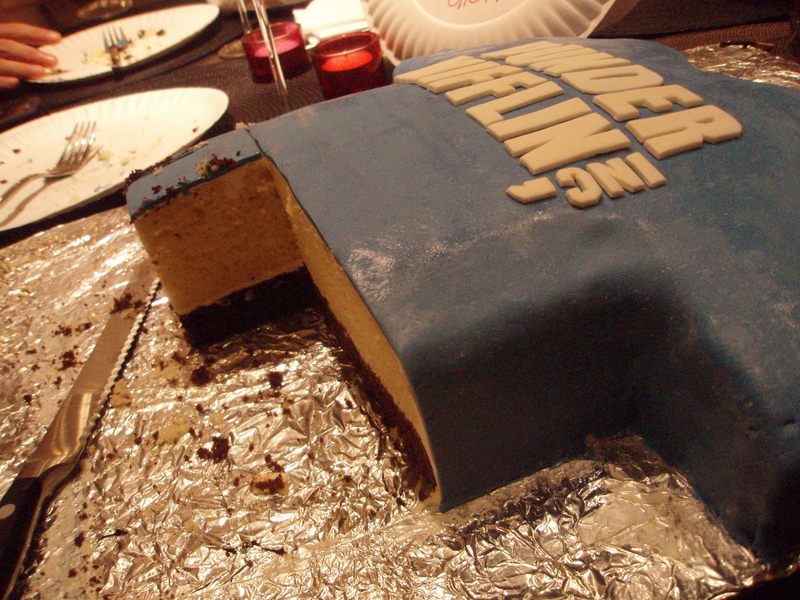 Lastly: Cut open and eat 🙂 Nomnomnom….